Zebronics has announced its newest tower speakers, the ZEB-BT7600RUCF. Priced at Rs. 8,888, the speakers comes with a 3-way acoustic design and 1.5-inch silk dome tweeter. It also comes with 8-inch and 4-inch drivers which are magnetically shielded. In addition, it has a 80 Watts RMS as well as an SD/MMC card slot and USB port. The speakers also comes with dual wireless mics for karaoke and supports wirelesss audio streaming via Bluetooth. The speakers are available in all leading retail stores with a one year warranty. Zebronics India Pvt. Ltd., India’s leading supplier of IT peripherals and Audio/Video products makes another Towering Impression for the sound as much as the design with the launch of its latest ‘Tower Speakers – ZEB-BT7600RUCF’ which promises to fill your room with sound, and not just boxes. Take immense delight in the mellifluous sound that enables you to listen to every beat – crisp and clear – because with ZEB-BT7600RUCF Tower Speakers every beat counts! Priced at Rs. 8888/-, ZEB-BT7600RUCF enhances your audio quotient, with its engineering brilliance and modern design, all housed in a wooden enclosure, and slim design which harmonizes the décor and adds fashion to every room. Experience and feel every beat of the music. Do not miss out the thumping-heart bass audio effect & built in amplifier which is sure to give you an amazing experience with wider dispersion of sound throughout the entire room. With dedicated Volume, Bass and Treble controls the smooth, rich sound brings in the ability to absorb the listener in the music for hours on end.The speakers with 3 way acoustic design, 1.5 inch silk dome tweeter further paired with 8 inch and 4 inch drivers its nothing beyond superior sound experience. Its massive 80 watts RMS, guarantees pure unadulterated sound which exceeds your home entertainment experience. The drivers are magnetically shielded to avoid interference on monitor and TV. 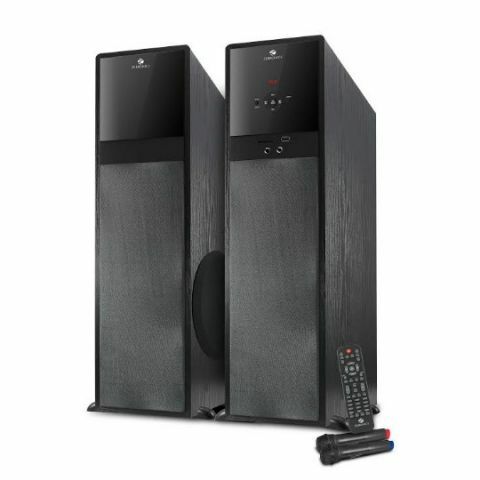 The Tower speakers ZEB-BT7600RUCF can be easily connected to your PC, TV, MP3 player or DVD player to listen to audio from these sources. It also includes a USB port and an SD/MMC card slot. Enjoy your favorite songs saved on other USB-enabled devices and SD/MMC cards at high volumes through this speaker's USB connector. The speaker also support wireless audio streaming through bluetooth, you can play your favorite track right from your mobile phone or tablet to the speaker. The speaker comes with dual wireless mics for the karaoke. In Case you run out of media files, the tower speaker is accompanied with FM tuner, allowing you to hear broadcasts from your favorite radio stations. The bright LED display, present at the front with unique Touch sense controls, on to provide you better control over its various features. The ZEB BT7600 is sure to take your listening experience to another level with loud and booming sound devoid of distortion at your parties and social gatherings. The product is already available at leading retail stores with 1 Year warranty.